Wholesale floating keychains personalized with your logo or blank. 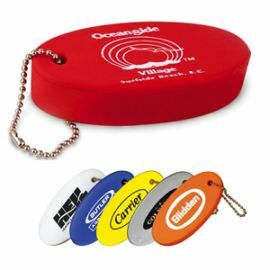 Lowest cost in USA and Canada for promotional floating keychains. Free artwork design . American clients pay no taxes. We will send you a proof for your approval before production. Unit Prices below include your one-color silk-screened imprint on one side only. We also supply blank (not personalized) floating keychains at the same unit prices as below, but without a Setup Charge. Second Side Imprint: add $0.25 per key chain, plus another Setup Charge of $35.00. Setup Charge: $35.00 per color, per floating keychain. Production Time: 5-7 Working Days after art approval. Rush production is available: contact us. • Size: 3-1/8"x 1-1/2", Oval. Item Colors: Red, Black, Blue, Red, Yellow, Green, White. Other colors may be available: contact us. Imprint Area : 2" x 1-3/4"
Production Time: 5-7 Working Days after art approval. Rush, 2-day production is available: contact us. Packaging: Bulk; 125 units per carton of 5 lbs. Add $0.05 per keychain for individual polybags.